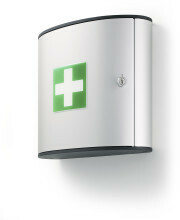 Medium sized aluminium first aid box supplied complete with 36 first aid components. Will hold kits for organisations with up to 50 employees. Large aluminium first aid box supplied complete with 65 first aid components. 3 fold-out compartments allow quick and easy storage of products.